Interested in watching NBC’s The Voice online? 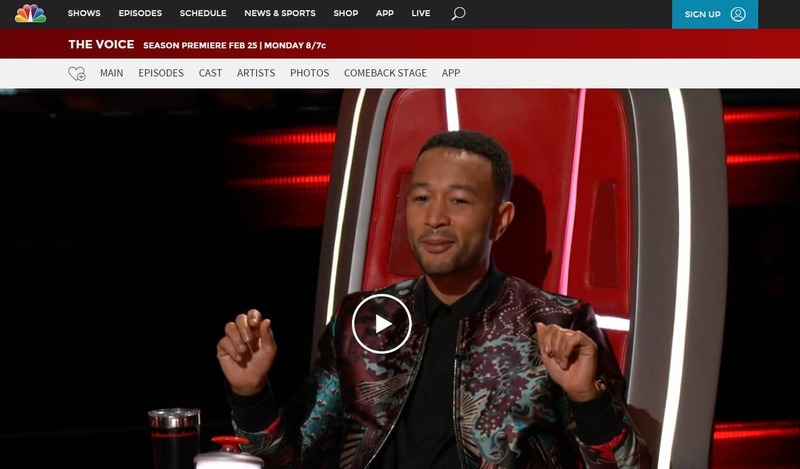 This post explains how you can live stream The Voice season 16 using a Virtual Private Network (VPN). This means you’ll be able to watch The Voice whether you’re at home or abroad. Season 16 of The Voice is fast approaching. This year, it’ll begin on Monday, February 25 at 5 PM PST / 8 PM EST. While the broadcast schedule hasn’t been revealed as yet, The Voice usually airs two episodes per week: one on Monday and one on Thursday. We’ll only be recommending official sources in this guide. Although it’s possible to find unlicensed streams for almost any event online, we strongly advise against their use. Even if you ignore the copyright issues they present, these unauthorized streams are almost always low-quality, low-resolution, and prone to being taken down part way through. VPNs are among the easiest ways to unblock geo-blocked platforms and stay safe while streaming. 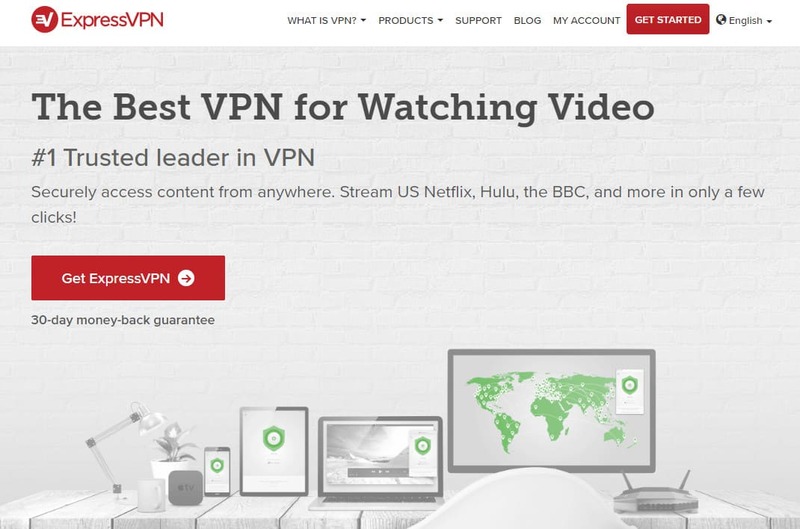 We recommend ExpressVPN; it has more than 2,000 servers across 94 countries, is fast enough to stream live HD video, and can bypass even the most stubborn geo-restrictions. This means you’ll be able to access platforms like Netflix, NBC, and BBC iPlayer from abroad with no issues. Getting started is simple. First, choose the length of time you’d like to subscribe for: one month, six months, or a year. Next, go to the checkout and pay. ExpressVPN comes with a 30-day money-back guarantee, so you can test the service by streaming several episodes of The Voice. If you’re not satisfied, just cancel within 30 days to receive a full refund. Decide which VPN service you’d like to use. We touched upon ExpressVPN above but you may also want to consider NordVPN and CyberGhost, two low-cost, high-quality alternatives. Download and install the VPN software. There will be a few different versions, so make sure you select the correct one for your operating system. Choose one of the streaming sources we discuss below. Connect to one of your VPN’s servers in the appropriate location. For example, you’d use a US server for NBC, or a UK one to unblock ITV Hub. Try loading a video from your chosen source. It should start almost immediately. Note: you may have to refresh the page before you see any changes. We recommend using the above steps to test your VPN before The Voice actually begins. This way, you’ll know in advance if something isn’t working properly and will have plenty of time to get advice from your VPN’s customer support team. Where can I watch The Voice live online? There’s only one way to watch the 16th season of The Voice online: you can stream it live on NBC. It’s virtually impossible for non-US residents to tune in, though, since NBC asks you to log in with your cable provider details. If you don’t have cable, you can also sign in with a valid DIRECTV NOW, FuboTV, Hulu, or Sling TV subscription. If you try to watch from outside of the US, you’ll see the following message: “LIVE STREAM UNAVAILABLE IN YOUR AREA – Go to Episodes page to watch full episodes”. Don’t worry — if you’re a US resident who’s currently abroad, you’ll be able to watch using one of your VPN’s American servers. NBC currently allows users to create an account, which allows you to watch three on-demand episodes free. This isn’t the ideal way to watch since you’d have to wait until the episodes were added, but it might be enough if you’re only interested in streaming the finals. Where can I stream my country’s version of The Voice? While the US version of The Voice is the most popular, it’s by no means the only one available. In fact, more than 15 countries have their own regional variant. Below, we’ll explain where you can watch your country’s iteration of The Voice. The Voice UK just began its eighth season. Tom Jones, will.i.am, Jennifer Hudson, and Olly Murs are this year’s judges, and since there have already been plenty of standout performances, they’ll have their work cut out this time around. British viewers can tune in online via ITV Hub or TVPlayer.com. This service is free to use, but you will have to create an account before you can start streaming. Note: although ITV Hub doesn’t make it obvious and has no verification process, UK law requires you to have a valid TV License to watch live content as it’s shown on TV. In Canada, you can watch the American version of The Voice live on CTV. Don’t worry about missing it, either, since CTV adds the show to its on-demand library the following day. Note, however, that you will have to sign in with your Canadian cable provider credentials before you can stream anything. Canada also has a French-language version of The Voice, called La Voix. Season 7 started on February 10, and will run until the final on May 5. Éric Lapointe, Lara Fabian, and Alex Nevsky are still coaching, but Garou has been replaced by Marc Dupé this year. If you’re interested, you can stream new episodes live, free of charge on TVA. No registration or payment is required to stream CTV or TVA content live. 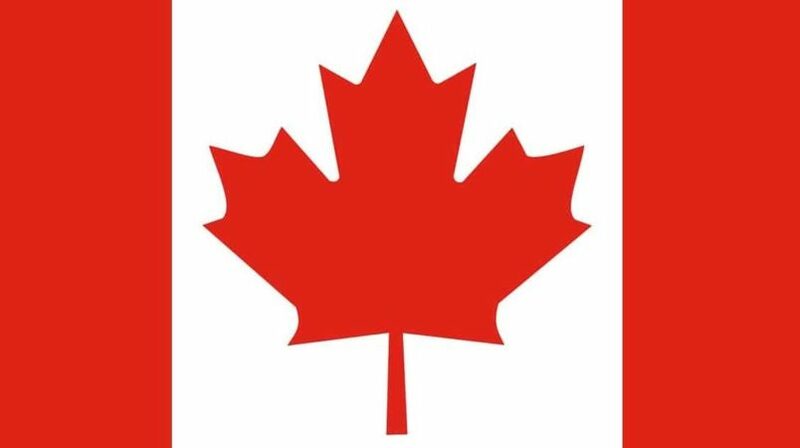 However, only viewers in Canada (or those connected to a Canadian server) are able to watch. Audiences in France, Monaco, and Luxembourg can stream The Voice – la plus belle voix season eight for free on TF1, both live and on-demand. Season eight’s judges are Mika, Jenifer, Julien Clerc, and Soprano, and the new series has just begun, so there’s really no better time to start watching. TF1 asks users to create an account before they can begin streaming. This is free, and is a simple email verification with no payment needed. However, even registered users can’t access the TF1 live stream from outside of France. As a result, you’ll have to connect to one of your VPN’s French servers to watch from abroad. Голос (The Voice) finished its seventh season last month. If you still haven’t gotten caught up, you can stream the entire season, as well as Голос. Дети (The Voice Kids) on-demand on Channel One. While this service doesn’t require payment or registration and is available from anywhere in the world, we still recommend using a VPN to reduce the risk of your ISP throttling your connection. We’ve covered some of the most popular regional variants of The Voice above, but there are just too many to mention individually. If your country isn’t listed, you can find suitable local sources in the list of The Voice-franchise shows. Can I use a free VPN to watch The Voice? You might be tempted to use a free VPN, but they often introduce more problems than they solve. First of all, free VPNs usually have fewer servers than premium services, yet more users. This leads to network slowdowns, and in practical terms, you’ll likely experience choppy playback and long buffering times when streaming. In an attempt to mitigate this, some free services have instituted monthly data limits. Far from solving the problem, however, this simply makes these VPNs unsuitable as a long-term streaming solution. How can a free VPN service afford to operate? Simply, it’s because you’re paying for it, albeit indirectly. Most free VPNs inject ads into the web pages you visit, but some go even further. By storing tracking cookies on your device, it can see exactly what you do online, even after you’ve disconnected from the VPN. This enables the service provider to record a wealth of consumer data that can then be sold to third parties without your knowledge. It’s not just your personal privacy that’s at risk, but your system security too. A 2016 study of free VPNs for Android found that dozens never actually encrypted any user traffic whatsoever. This doesn’t even take into account the 38% of surveyed apps that attempted to install malware on the user’s device. A well-known service doesn’t guarantee you’re safe either, as shown by the Hola botnet controversy. To stay as safe as possible online, we recommend using a reputable VPN service that puts its customers’ privacy first. How does The Voice work? If you’ve seen a talent show-style series before, you’ll probably know what to expect from The Voice. Aspiring singers apply to the show and take part in an open audition. If they’re good enough, they’ll then do a callback audition. Most of this happens off-camera, however. The next stage is called a blind audition, and it’s one of the most exciting parts of the show. The four judges sit with their back to the contestant and if they like what they hear, can press a button to turn around and invite the performer to their team. If multiple judges turn around, the singer gets to choose whose team they join. Next, The Voice contestants face off in a series of one-on-one performances. The person who performs best progresses, and the one who doesn’t is eliminated. There’s one caveat: each judge is allowed to “steal” two performers, adding them to their own team and preventing them from being kicked off of the show. The final stage is where popularity makes all the difference. The one-on-one battles continue, but this time, the viewers are allowed to choose who wins. This continues until there’s just one singer left, at which point they win and are granted a record contract. Who are The Voice’s Season 16 coaches? 3 Where can I watch The Voice live online? 4 Where can I stream my country’s version of The Voice? 5 Can I use a free VPN to watch The Voice? 6 How does The Voice work? 7 Who are The Voice’s Season 16 coaches?